It was an Open Gardens day at a village not far away from us, so we made the most of the sunny weather and headed off. I love having the chance to be nosey and peek into other peoples' gardens. However, it does make me wish I had a bigger garden! Here are just a few of the highlights. The first garden, above, had lots of areas, and some beautiful cottage garden planting. They were trying to be as eco-friendly as they could, with compost from the local council, a wormery, compost bins, mulches round the veg plot and all beautifully laid out. A lot of time and effort had gone into all the gardens, but this one was especially impressive. This one was an artist's garden, with lovely planting and interesting sculptures dotted about. 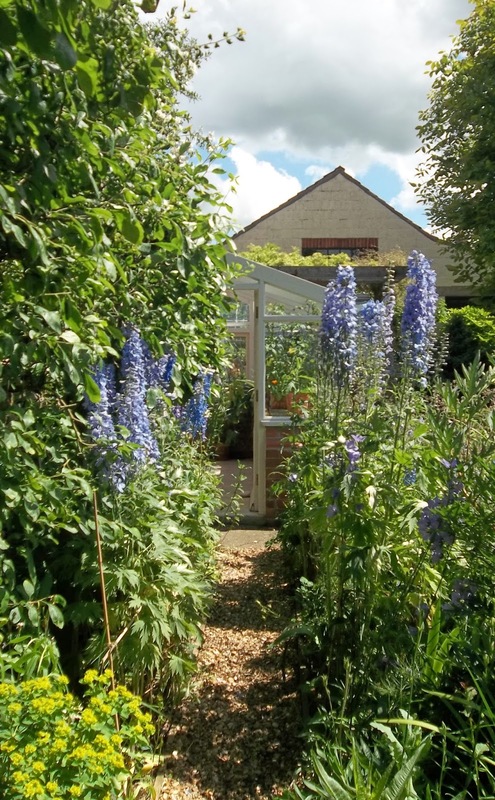 I loved walking down the path through the blue spires of delphiniums. 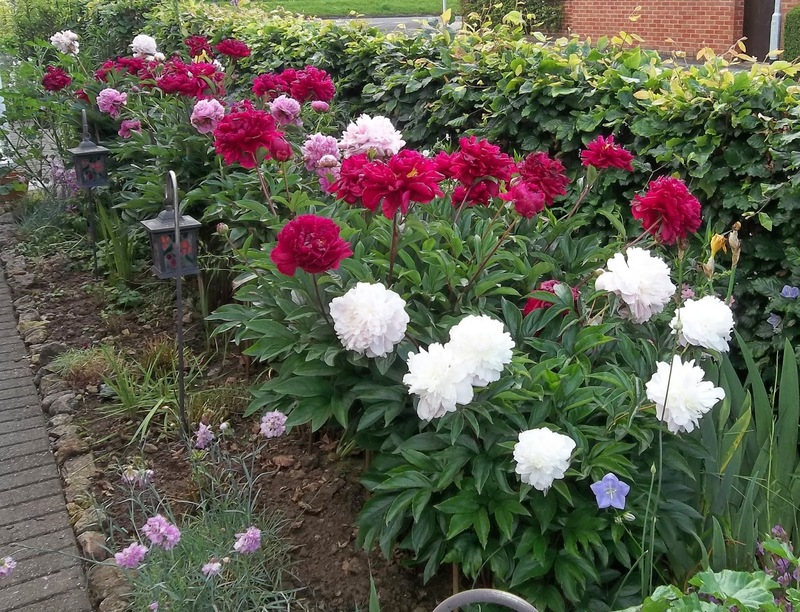 One of my favourite gardens had this fantastic display of peonies, along the side of the house. The owner was so welcoming and had free plants (yes, free! ), although we did give a contribution for the local church funds. I got a lovely dark leaved hardy geranium. 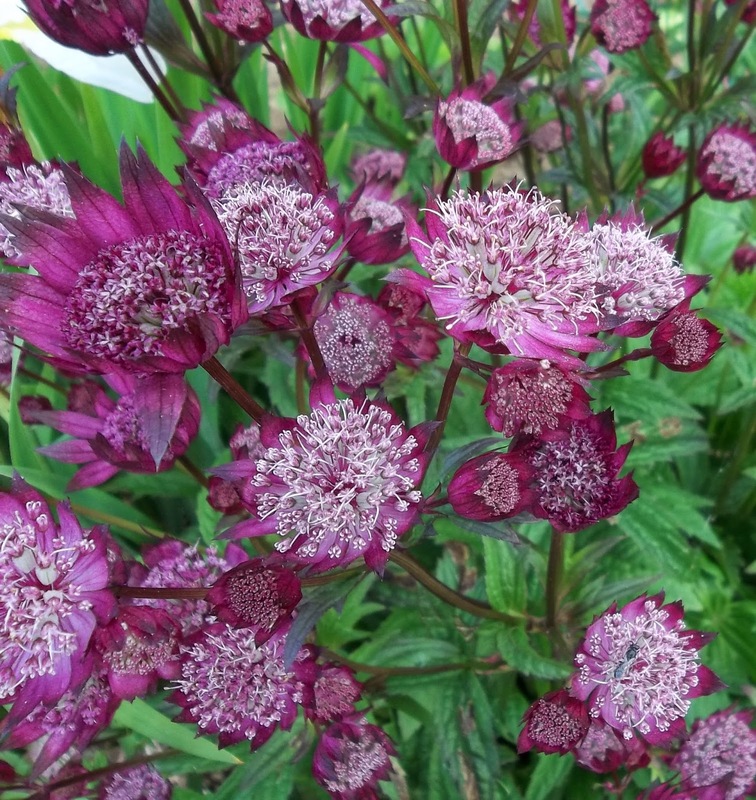 The same lady had this rich, jewel coloured astrantia in her front garden. Lucky her! Her garden went all around the house and the front was lovely herbaceous plants. The back garden was gravelled, but had a huge number of interesting plants in pots and in the gravel. 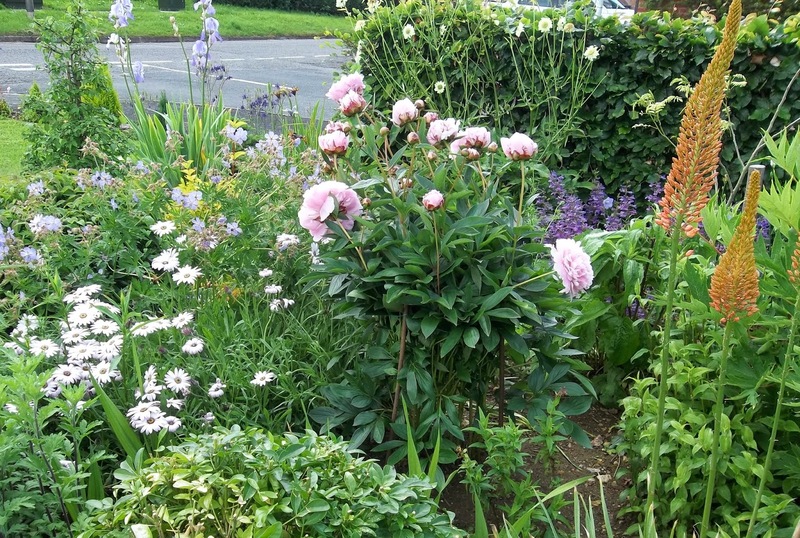 This was part of the front garden with romantic, feminine planting. 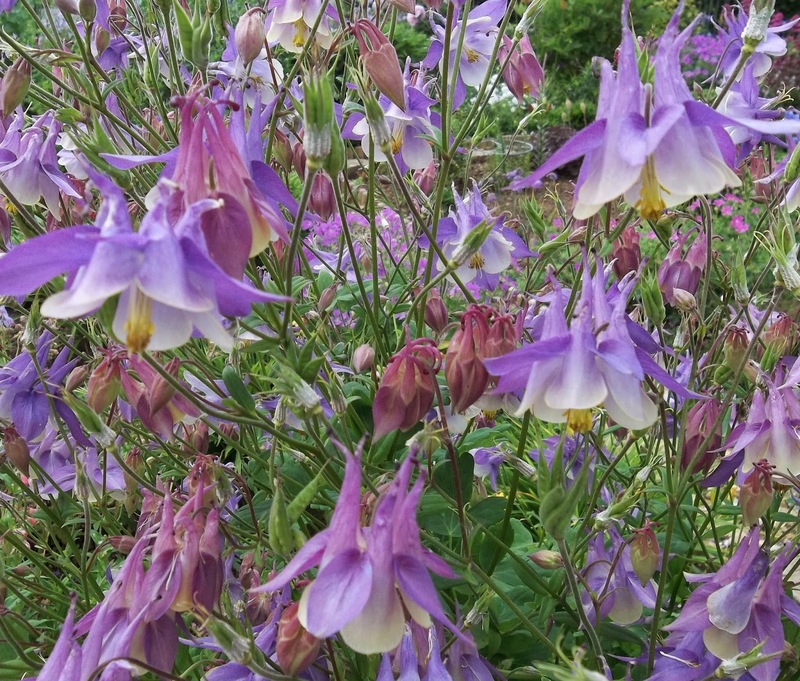 This aquilegia was about three feet tall - the colours were just beautiful. 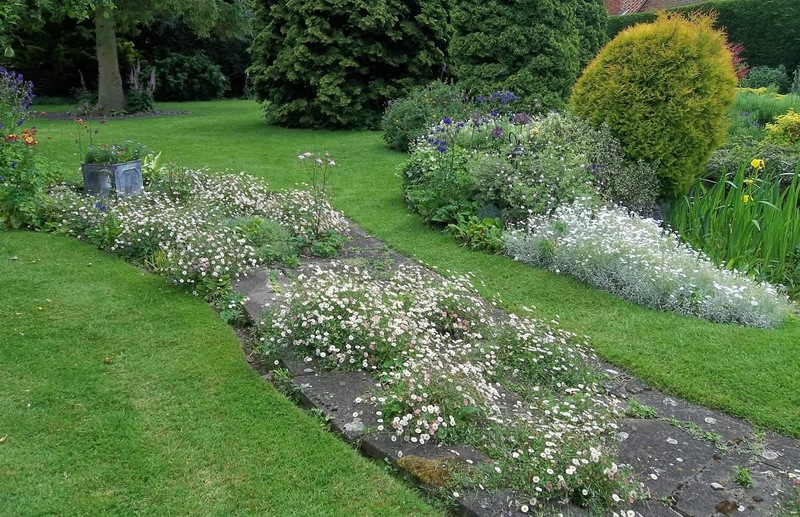 This garden was full of interesting areas too and I particularly liked the river of mexican daisies (erigeron) which had seeded in the paving. Once we had looked round the nine gardens, all of which were lovely and were different sizes and styles, we went to the church for tea and cake (there just has to be cake!). Coffee and walnut for my sister-in-law and Victoria sandwich for me. A perfect finish to a lovely couple of hours - and the weather stayed fine all the time we were out! Thanks, Alison. It was a fabulous day and the gardens were all so interesting and beautiful. An Open Gardens day just isn't the same without cake, is it?! Thanks, Jane. It was a lovely visit - there were lots of other open gardens in the area open yesterday too, but sadly, we had to just pick one! The peonies were stunning and they seemed to be very popular as they seemed to be in every garden in one form or another. The free plants were amazing (aren't gardeners so nice? ), as were the cakes! How wonderful the open gardens are! I wish I could go. Thank you, Poirot and hello and welcome to my blog. 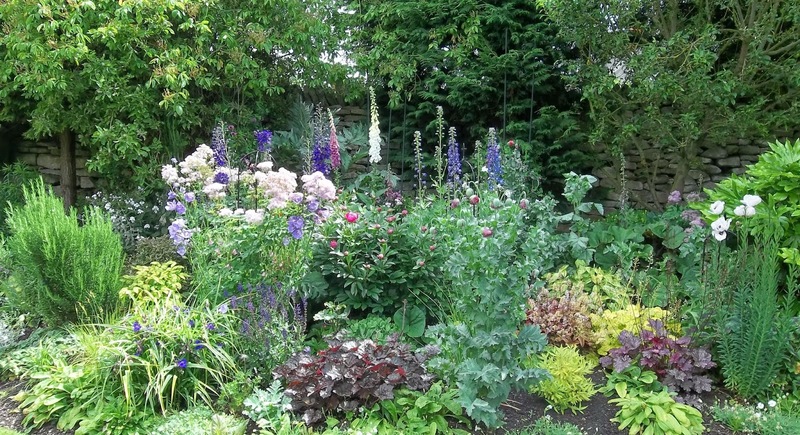 I love going to Open Gardens as they often give some ideas of things or plants you can use in your own garden. I am sure you would have loved seeing the different sizes and styles of gardens too. I hope you have a good gardening week. 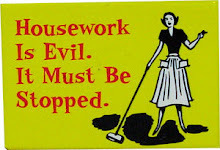 Still, another thing to aim at! Have a good gardening week. Thanks, Joy. I am thinking I need to try again with an astrantia like that - it was stunning and it was in a sunny part of the garden and thriving. I really enjoyed the visit (partly because I'm nosey and partly because I just love plants and gardens! Beautiful! This is one of my favourite things to do. Garden visiting and eating cake, two fab things, is there anything nicer? Thanks, Anne. I love garden visits too and there must be cake - that is an essential part of the whole experience!